Residents in Haryana will now be able to pay various bills, like electricity and gas, through Paytm. The state government has signed a Memorandum of Understanding with One97 Communication Limited, popularly known as Paytm which will also develop and promote 1000 entrepreneurs in Haryana who will facilitate the Paytm services. 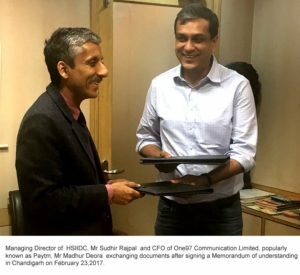 Managing Director of Haryana State Industrial and Infrastructure Development Corporation, Sudhir Rajpal, signed the Memorandum of Understanding (MoU) on behalf of Haryana State Industrial and Infrastructure Development Corporation Ltd (HSIIDC) while Madhur Deora, CFO signed on behalf of Paytm. As per the MoU, Paytm will promote financial inclusion by providing banking services in villages of Haryana and also provide financial products to small traders and farmers in remote and rural areas. Paytme will also share its technical and financial expertise to support the digitization of various schemes across departments. “This MoU would be a step forward in the endeavor of the State Government to encourage digital transactions in the State. Under the MoU, the Paytm would facilitate collateral Free Loans for MSMEs based on their transaction history on Paytm. It will collaborate with HSIIDC to establish a Centre of Excellence (CoE) in Haryana and would provide manpower for training and skill development. Also, the Paytm would provide employment to 200 persons in industrially backward areas of the State.” said Sudhir Rajpal. “Paytm has initiated the necessary study for identifying a district in the State to launch its pilot initiative for training the local people as associates and entrepreneurs and designated a team under a senior executive to take the initiative forward. We will also take up the facility for providing collateral free loans to the MSME merchants in the State over the next three to six months,” said Madhur Deora. Also, the HSIIDC has a plan to undertake the annuity distribution numbering about 75000 through the Paytm platform as a Pilot initiative.